From office to light engineering our team offers a level of expertise that is second to none. 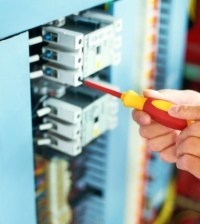 We are able to help you with the simple things like moving a power point to be near your new computer, though to wiring in three phase electricity to run your new machine in the loading bay. If you would like advice on energy efficient lighting and saving power, please call us. How much does it cost to move a light switch? For most people price is very important, it is to us too. Every job is slightly different, but we are happy to give you a quotation for the work you need doing. Our quotes are free of charge and without obligation. Call us now to find out how we can help you. Do you install heat pumps? WE offer a complete service to install heat pumps in and around the Hamilton area. If you would like to know more please give us a call 0800 364 8255.